Using up the Thanksgiving leftovers is never a problem in our house. Maybe it’s because we’re typically only cooking for five, not fifteen or twenty as some of our friends. Or maybe it’s because we only cook things we really love — there are no obligatory platters of mashed turnips, just because Aunt Sally insists on them. So no matter the reason, our post-Thanksgiving ritual is not finding ways to get through that last bit of stuffing but, more typically, exclaiming with happiness about our Friday lunch plates of stuffing, gravy, cranberry sauce and caramelized pearl onions, and wondering why we don’t make these dishes more often. 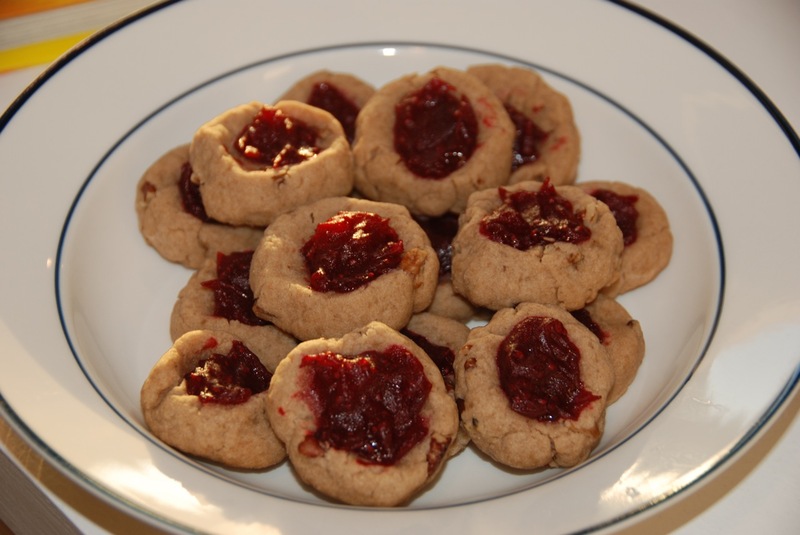 An added wrinkle this year was the fact that Ben had spotted this recipe in a recent issue of Sunset magazine and became consumed with the idea of using our leftover cranberry sauce in cookies. We didn’t have any leftover cranberry sauce (partly because he eats it by the cup), but for him, I made an extra batch. The cookies are well worth it: a wonderful not-too-sweet shortbread, with a great tang from the cranberries. If you avoid nuts, just leave them out and the cookies will still taste great. I think these’ll become a regular part of our holiday cookie repertoire. 1. Heat oven to 350°. Whirl sauce in a food processor until smooth, about 30 seconds; set aside. 2. Beat butter and sugar together in the bowl of a standing mixer until smooth. Stir in vanilla extract. Add flour, spices, and salt, then mix on low speed until blended, scraping inside of bowl as needed. Stir in pecans. 3. Form dough into 1 1/2-in balls and set 1 in. apart on a greased baking sheet. Use your thumb to press a well into center of each cookie. Spoon about 3/4 tsp. cranberry sauce into each well. 4. Bake cookies until light golden brown, 12 to 15 minutes. Let cool completely on baking sheet. I’ve been looking for some nut-free, chocolate-free Christmas cookies (for one friend in particular) and didn’t want the plate to have only spice cookies on it–this looks great!